Before you begin, you need to make sure you have access to the server and your account must have the appropriate administrative privileges to install applications. 1) Download the Workflow Scheduler from the product page Link. 2) Add it in the app catalog on your site in "Apps for SharePoint". You will find the app catalog library by navigating to your Office 365 admin center, selecting "SharePoint" under the "Admin" section, then the "apps" navigation link left and then App Catalog under the listed links. Depending on your O365 subscription plan you will need to navigate to your app catalog directly using the web address: https:/[your_domain_name].sharepoint.com/sites/AppCatalog/. 3) Go to the site where you will add Workflow Scheduler for Office 365. 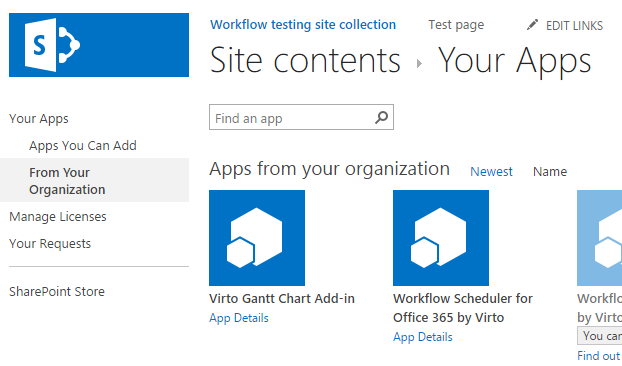 4) Click “Site content”, add a new app and choose the link "From Your Organization", click "Workflow Scheduler for Office 365 by Virto" icon and trust it. 5) Now you are ready to schedule workflows in your SharePoint!